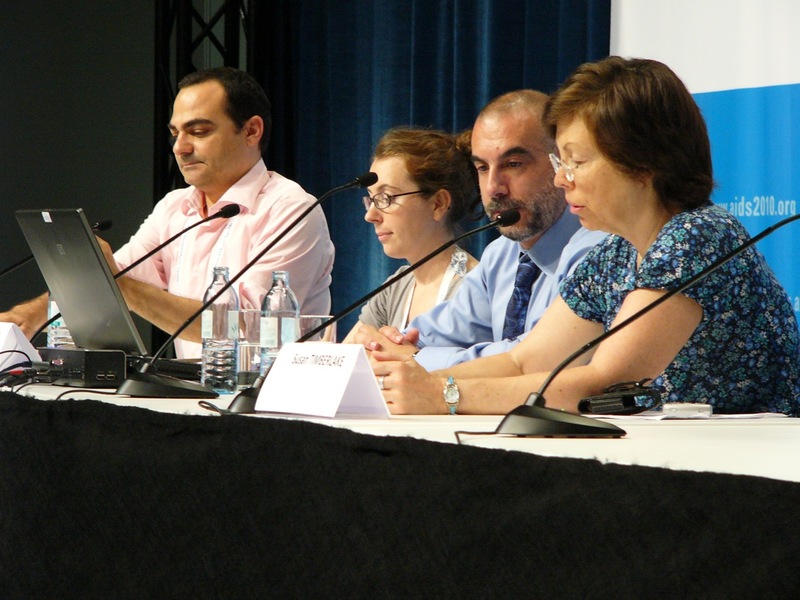 The XVIII International AIDS Conference held last week in Vienna was a hotbed of anti-criminalisation advocacy, including an extremely well-attended and well-received pre-conference meeting – Criminalisation of HIV Exposure and Transmission: Global Extent, Impact and The Way Forward – that I co-organised on behalf of NAM, along with GNP+ and the Canadian HIV/AIDS Legal Network. We're working on editing the video of the six presentations and panel discussions right now, and this should be ready later this week. I'm also working on an article for NAM's HIV Treatment Update that will synthesise all of the data and advocacy presented at the conference, and over the next week or so will be adding blog posts that highlight some of the work that I couldn't include in the piece, as well as media reports focusing on criminalisation at the conference. In the meantime, I'd like to draw your attention to four major advocacy resources that were launched at the conference. HIV and the criminal law is a new online resource that I wrote and edited for the UK HIV information charity, NAM, and launched at AIDS 2010 in Vienna. A book version will be available in September 2010. Pre-order your copy here. Preface by The Hon. Michael Kirby AC CMG and Edwin Cameron, Justice of the Constitutional Court of South Africa. Introduction How this resource addresses the criminalisation of HIV exposure and transmission. Fundamentals An overview of the global HIV pandemic, and the role of human rights and the law in the international response to HIV. Laws A history of the criminalisation of HIV exposure and transmission, and a brief explanation of the kinds of laws used to do this. Harm Considers the actual and perceived impact of HIV on wellbeing, how these inform legislation and the legal construction of HIV-related harm. Responsibility Looks at two areas of responsiblity for HIV prevention: responsibility for HIV-related sexual risk-taking and responsibility to disclose a known HIV-positive status to a sexual partner. Risk An examination of prosecuted behaviours, using scientific evidence to determine actual risk, and how this evidence has been applied in jurisdictions worldwide. Proof Foreseeability, intent, causality and consent are key elements in establishing criminal culpability. The challenges and practice in proving these in HIV exposure and transmission cases. Impact An assessment of the impact of criminalisation and HIV – on individuals, communities, countries and the course of the global HIV epidemic. Details: international resource and individual country data A summary of laws, prosecutions and responses to criminalisation of HIV exposure or transmission internationally, and key sources of more information. The 2010 Global Criminalisation Scan Report from the Global Network of People Living with HIV (GNP+) gives a global overview of the extent to which criminal and other laws have been used to prosecute people living with HIV for HIV transmission and exposure. The full impact of these laws on the human rights of people living with HIV and on access to treatment, care and support has yet to be fully understood. However, the evidence presented here shows that there is no correlation between the HIV prevalence in a country and the willingness of countries to use criminal laws and other punitive measures to regulate transmission. The report gives examples of instances where people living with HIV have expressed concerns about negative consequences that come from the overly broad use of laws in cases of transmission and exposure to HIV. This report highlights the urgent need for government reform and calls for the guided application of expert evidence and legal opinion to stem the swell of prosecutions and to counter the false premise of the perceived benefit of HIV-specific criminal laws. In response to the increasing use of criminal law internationally, as well as to the great need to develop tools for lawyers representing people living with HIV, this kit provides both informative documentation to support lawyers in the preparation of their cases and selected publications that can ultimately be presented in court. HIV Non-Disclosure and the Criminal Law: Establishing Policy Options for Ontario (Eric Mykhalovskiy, Glenn Betteridge and David McLay). 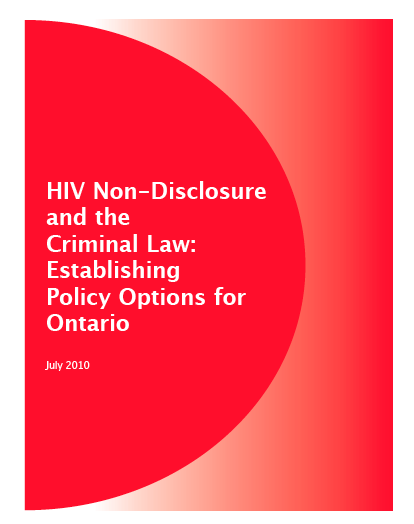 This report contributes to the development of an evidence-informed approach to using the criminal law to address the risk of the sexual transmission of HIV in the province of Ontario. In recent years, the application of criminal law powers to circumstances of HIV exposure in sexual relations has emerged as a key HIV-related policy issue. In Ontario, people living with HIV/AIDS (PHAs), AIDS Service Organizations (ASOs), human rights advocates and others have raised concerns about the expansive use of the criminal law in addressing HIV-related sexual offences. They have raised questions about fairness in the application of the criminal law and about its negative consequences for PHAs and established public health and community-based HIV prevention strategies. This report is rooted in these concerns. It responds to them in two ways. First, it explores various forms of evidence relevant to a thorough policy consideration of the use of the criminal law in circumstances of sexual exposure to HIV. Second, it proposes policy options for addressing the problems posed by the criminalization of HIV non-disclosure in Ontario. 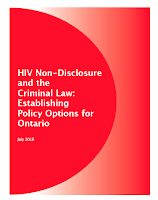 This report emphasizes that uncertainty in the criminal law formulation of the obligation to disclose HIV+ status is foundational to current problems in the use of the criminal law to regulate the risk of the sexual transmission of HIV in Ontario. It further emphasizes policy issues and problems arising at the nexus of science and criminal justice, in particular, those posed by the inconsistent use of complex scientific research by courts in deciding cases of alleged HIV non-disclosure. Finally, the report underscores that the criminalization of HIV non-disclosure hinders established HIV prevention efforts and contributes to HIV-related stigma.